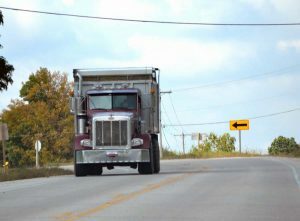 Ag CMV or CMV – know the weight limit for a smooth harvest season. Wisconsin crops need to be harvested and transported from field to farm or field to market. Wisconsin law allows for commercial motor vehicles (CMVs), registered at a gross weight of 50,000 pounds or more, to operate by not more than 15 percent over weight limit based on the 348.15(3)(c) weight table. Effective March 3, 2016, the start date for seasonal weight limit is August 1 of that year. This weight increase can not be combined with weight limits for IoH or Ag CMVs. Has a registered gross weight of 50,000 pounds or more. Is a motor truck, farm truck, road tractor, truck tractor, or farm truck tractor or such a vehicle combined with a semitrailer, trailer, or farm trailer, when the vehicle or combination is a commercial motor vehicle operated on a highway. (b) This subsection does not apply to the national system of interstate and defense highways, except for the I 41 corridor and that portion of I 39 between USH 51 and I 90/94. Is an implement of husbandry. This subdivision does not apply from May 24, 2014, to January 1, 2020. (b) This subsection does not apply to the national system of interstate and defense highways, except for the I 41 corridor.